Performing CPR (cardiopulmonary resuscitation) is where blood is manually helped to circulate around the body which helps provide oxygen to the brain, heart and other vital organs. If oxygen does not get to these parts of the body the person will die. But CPR is designed so that if it is not done quite right then you won't harm the victim. Really the person is already technically dead so you won't kill him/her if you don't do exactly 30 compressions or if you don't do them fast enough. Follow these steps as close as possible, but do not get anxious if it doesn't quite go how you think it should. Danger, Response, Airway, Breathing, Compressions and Defibrillator. D - check for DANGER - Hazards, risks and safety? If not give 2 initial breaths (puffs for a baby). Check that the chest raises and falls. If no signs of life give 30 COMPRESSIONS then 2 BREATHS (close to 2 compression per second) - 5 cycles in approximately 2 minutes. D - DEFIBRILLATOR (AEDs)- if and when available follow the voice prompts from the defibrillator. The full name for defibrillator is Automated External Defibrillators (AEDs) and they are devices that shock the heart back into a normal rhythm. Always stay with the person until help arrives. Keep the emergency services informed of persons condition - if possible ask someone to do this for you. Check for any visible signs of injury. Control severe bleeding by applying direct pressure to the affected area. Support broken bones (fractures) through immobilisation of the limb. Prevent further injuries to the casualty. 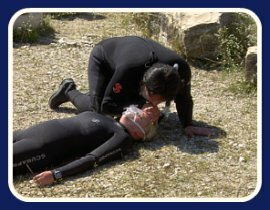 If you have not done a CPR and First Aid Training Course, FirstAidAnywhere.com strongly recommends that you do a course in your local area or online. Our CPR and First Aid Courses page gives you the run down on the three different types of courses being offered as well as the pros and cons for each option. We also have suggestions on which organisations to train with. Why do I need to tilt the person's head? How do I get air into the persons lungs? What about my hand position for performing CPR compressions? How deep do I compress the rib cage? How do I hold my hands to do a compression? What about 2 person CPR? How long do I keep doing CPR for? Is the old way of doing CPR wrong? So why do I not routinely roll the person onto their side to clear the airway? What does the term "normal breathing" mean? Why don't I check for a pulse any more? How come CPR ratio change from 15:2 to 30:2 - compressions:breaths? Are you confused about the reason for the changes in CPR? Go to new CPR guidelines for answers to the above questions. Where a rescuer is either untrained or unwilling to perform CPR they should deliver continuous uninterrupted chest compressions only at a rate of 100 per minute. 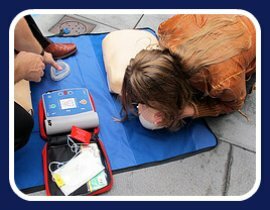 Untrained rescuers who seek basic life support instructions from Emergency Medical Services by telephone are advised to deliver continuous uninterrupted chest compressions only at a rate of 100 per minute. Training from an experienced instructor is the best way to be prepared in an emergency. 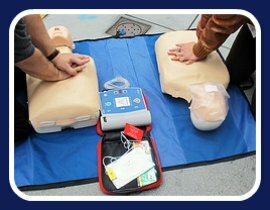 First-Aid-Anywhere.com strongly recommends that people from all walks of life, learn how to do CPR, by completing a certified CPR course. For information on courses and recommended organisations that run them go to our CPR and First Aid Course Options page.